The Information pane in OneDrive (Office 2016’s cloud storage) tells you everything you need to know about who shares a file or folder. To open the Information pane, select a shared file or folder and click the Information button (located in the upper-right corner of the screen). Then look in the Information pane to investigate how a file is being shared. In the OneDrive window, select the file or folder in question. The Share window opens, as shown here. This is the same window you use to share folders and files. The left side of the window tells you who shares the file with you. Changing how a file is shared. Select a name on the left side of the window. The person’s name appears in the center of the window. On the drop-down menu, choose Allow Editing, Change to View Only, or Stop Sharing. If you choose Stop Sharing, the person’s name is removed from the Share window and the person is no longer permitted to view or edit the file. 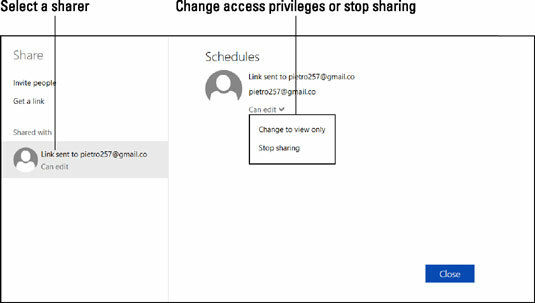 The Share window remains open in case you want to change how you share the file with others whose names are listed. Close to close the Share window.